A group on Ravelry decided to focus on finishing some of our knitting projects during the last month. In my post of August 25, I wrote about a wonderful sweater that I’m knitting and how this challenge was the perfect incentive to finish it in a timely manner. Well, so much for that idea. As so often happens, the days slip away and although I knit at least 2 hours every day, I just wasn’t in the mood to work on my sweater. I finished the back and started on the right front. Then all that row counting to decrease at the waist and then increase again, to decrease for the armhole and the neckline just seemed like it required more concentration than I had when I sat down to knit. 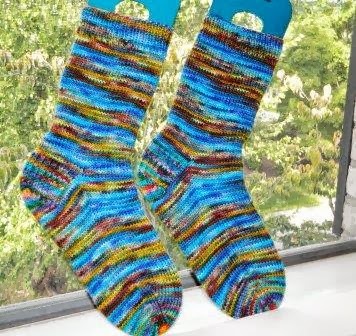 So instead, I finished 2 pairs of socks that have been lingering for quite awhile. The first is this lovely blue pair. 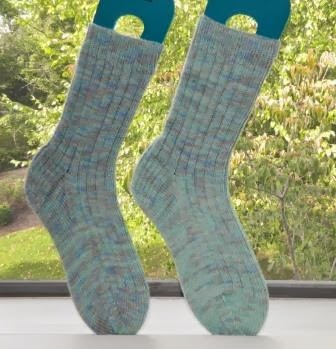 These a memory socks for me. I purchased the yarn in May, 2012 while visiting Dubuque, Iowa. There was a wonderful yarn shop called Yarn Soup. Both of these socks have been in progress for more than a year. My post of October 14, 2012 has more photos and discusses my plans to have them finished last year. I really don’t know where the time goes. But I now have two new pairs of socks for the Fall and Winter. There are still 2 other pairs on needles. Maybe I can finish at least one more pair this year. Besides my socks, I did finish knitting this doll coat for my Etsy shop. I started this last spring and for some reason put it aside when it was time to knit the sleeves. I love this pattern. 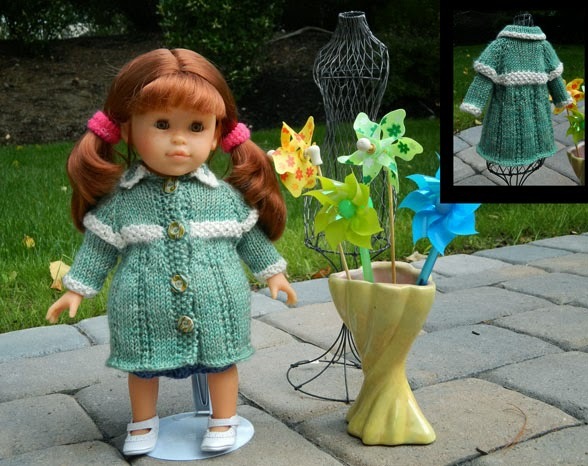 I adjusted the size of a vintage pattern for this coat to fit the Miss Corolle doll. She’s one of my favorite dolls to dress. I also made progress on lots of other projects. I’m working on a lap size afghan for charity along with several dress dishcloths for a local Holiday Boutique. Someday, I’ll focus my efforts on only three to five projects at a time and have finished knits in a shorter period of time but for now, this is my process. Why fight it, I’m having fun! A very special Thanks to Erin for organizing the blog hop. Please visit her blog HERE to follow the blog hop and see what everyone knit. That's such a cute little jacket and I love the blue of your socks.